Why does my horse need to have its teeth floated? As horse owners who love our horses we have made life pretty easy on our domesticated horses because of all the processed feeds such as pelleted feeds, processed hay, the horse's teeth do not always wear the way nature intended for them to wear. In the wild a horse eats rougher forage so their teeth wear differently. Because our horses do not get the grind on the teeth,(remember a horse's tooth is constantly growing), your horse may develop a mouth that gets out of balance his/her teeth develope sharp points. Those points on the outside of the mouth near the cheek tend to affect the nutritional assorption your horse gets from his feed, sharp points toward the tongue tend to affect the way your horse reacts to the bit. Your horse may form caudal hooks and rostral hooks and left unattended these two problems will cause a whole bunch of trouble for your horse. What do you do about these hooks? Proper and routine dentistry is the key. 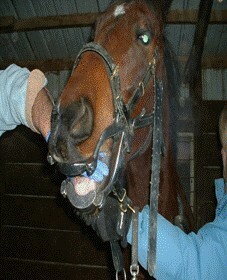 Unfortunately just having your horse's mouth maintained by hand floating is not enough. Today's equine dentist have the opportunity to use power tools. There are several different kinds of power. In the inexperienced or wrong hands they can do more harm than good. In our business we use a tool called an RA250. It has a diamond circular tip on the end., it prevents a horse from being cut and it also enables Joel to reach back and get those caudal hooks without hitting the mandible bone in the back of the horse's mouth. Why do I have to have these hooks removed? First they need to be removed for your horses health. If you don't remove the hooks your horse will eventually end up with a locked mouth. His jaw will not slide and he will no longer be able to chew. Keep in mind the horse's digestion starts in the mouth, if your horse does not grind his food properly it enters the digestion too large making his body work harder to break it down. Also, with caudal hooks if you don't remove them you can, not always though, have a horse start to buck under saddle, your horse suddenly starts to pull on your hands when you ask him to maintain a collected frame. You may see your horse when you release contact ..Shake his head from side to side. your horse and we all know when we are hurting our mind is on anything but being cooperative. Nothing wrong with asking the question. In today's economy we all want to be sure we are putting our money where we can have the most impact. In our opinion this is one area where horse owner's cannot afford to scrimp. All those supplements you feed your horse extra well, it is just money down the drain if your horse does not have good teeth, without good grind he will not produce the saliva in his mouth which in turn helps start the whole digestive process. Too big of food particles entering the food chamber and you are asking for trouble. Choking and colick to name a few. 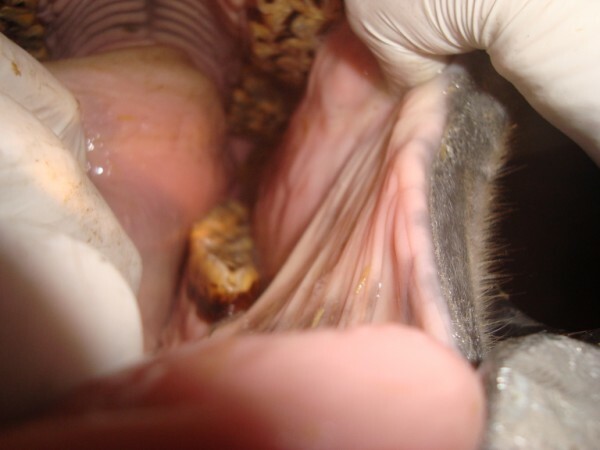 Horses who have been neglected with proper dental care generally are hard keepers many times it is not that the owners weren't being good horse owners but simply because they didn't know. Training cost is another place you can save if your horse has good teeth. I can't tell you how many times we have gone into a barn and the owner was having difficulty under saddle with a horse only to find out the horse was in extreme pain. We give discounts to 4-Hr's, pony clubbers, NBHA members and we give a mutliple horse owner discount. Just ask we will work with you..we believe in the importance of this work and hate to see anyone who owns a horse neglect this area of care.